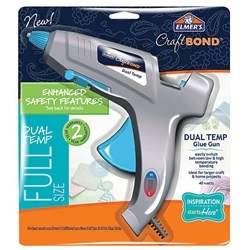 This glue gun offers added safety features for maximum use. The insulated nozzle safeguards against burns and a safety fuse shuts the gun off automatically if overheated. The built-in lifts on both sides of the gun allow the tool to rest safely on its side, without glue backup. Hot glue gun in full size, high temp, 40W.